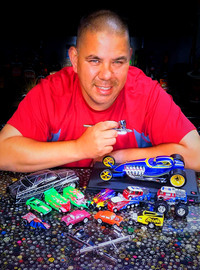 Joe Alvarado is a model car customizer who specializes in Hot Wheels and other diecast cars. In 2015, he placed 1st in the Diorama Class at the 2015 Hot Wheels Nationals for his entry ‘Taste The RainBLOWN’ and 2nd in the Pro Mild category at the 13th Annual Collectors Nationals Custom Car Contest in 2013 for ‘Gas and Glown’. He is known in the customizer community as LoRide57 Customs. He was inducted in 2017 into the Diecast Hall of Fame for his work as a customizer.